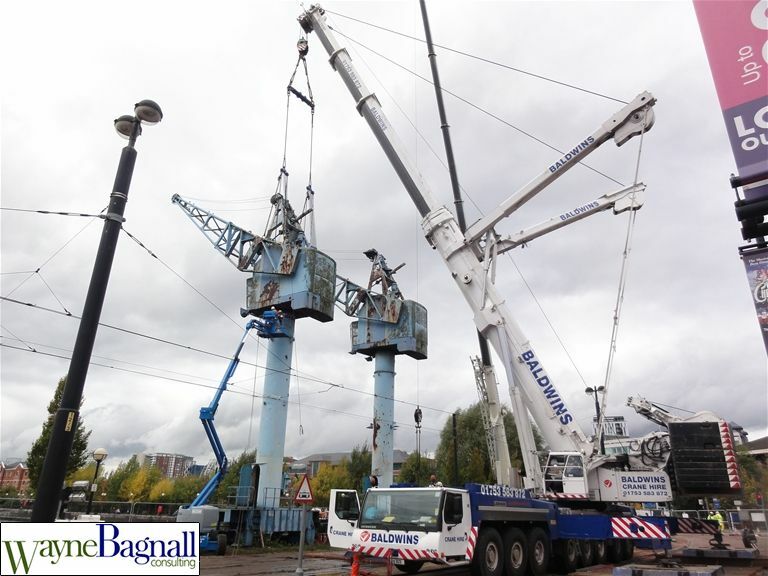 To safely dismantle 2 Stothert & Pitt DD2 travelling Dock Cranes from the waterfront at Salford Quays. These 2 1966 Cranes standing at 16m high weighing circa 80 tonnes per crane were straddled between the Main Metro-Link line and the recreational Lowry Salford Quays leisure park. Urban Vision were concerned that these cranes were deteriorating through exposure to the elements and lack of maintenance and although iconic they needed to be dismantled before the winter set in. They had a full weekend road/Metro-Link closure set from 02:00 on Saturday 26/10/13 to 04:00 Mon 28/10/13, however the weather was looking uncertain with predicted wind speeds in excess of the cranes safe limits. I was engaged by Anthony O'Connor and Sons Ltd (AOC) to assist with the tendering, planning and managing the operation. AOC were successful and were awarded the project, the hardwork now started with planning for the safe lifts (Lift Plans), CDM 2007 compliant plans of works including risk assessments and method statements. 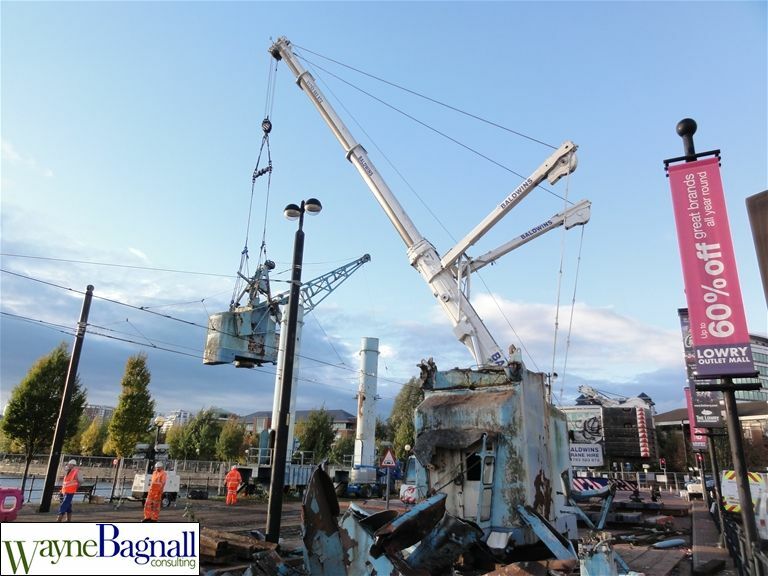 The partners involved were AOC (Main Contractor), Seward Wyon the Specialist Lift Engineers, Baldwin Crane Hire (500t & 70t Cranes) and Wayne Bagnall Ltd as AOC Specialist Demolition Engineer. A weather window was predicted having closely followed the Met Offices 5 day weather forecast for the planned closure. The works commenced and the cranes were dismantled successfully in 6 heavy lifts using a 500t main crane and 70t service crane safely over the Metro-Link O/H cables and onto prepared bases for size reducing. AOC new Komatsu 360LC fitted with a large steel shear swiftly removed the Jib and A frame from each crane before being loaded onto AOC (STGO 3) Low Loader for transporting back to their yard for recycling. The works were carried out without incident despite worsening weather conditions which caused several winded off periods. The whole project was deemed to be a complete success with no damage to any infrastructure allowing the road to be opened early and the trams to start running normally at the set time on the Monday morning 28/10/13. 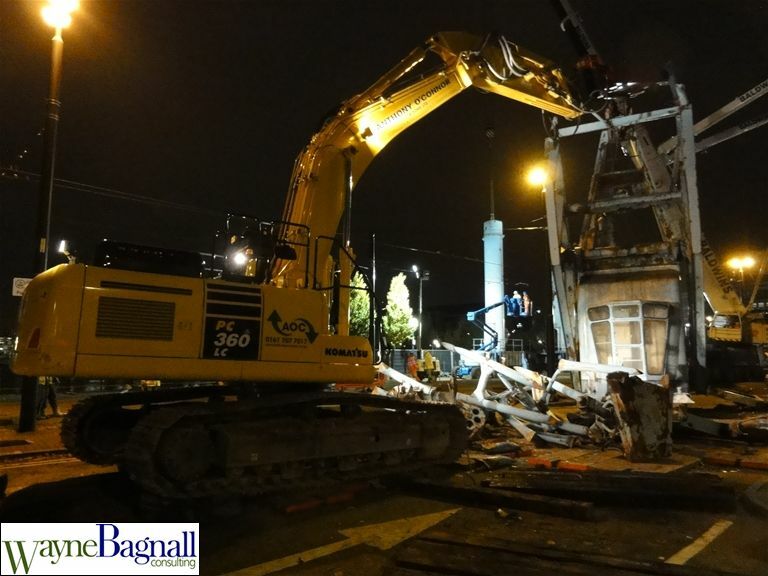 The Client, Urban Vision were extremely pleased with the performance of the demolition operation under the control of Anthony O'Connor & Sons Ltd.